As a Therme Plus hotel, we offer you the chance to use the iodine-saline spa daily - free of charge and for as long as you wish. Use of the saline and salt world and the large sauna area is also free of charge for you. Throughout the week there are exclusive exercise offers in the Bad Bevensen iodine-saline spa. If you have any questions about our Therme Plus offer, please do not hesitate to contact us. Warm bright colours, floor-to-ceiling glass windows and generous bathing landscapes - anyone who comes to Bad Bevensen to bathe for the first time may be surprised by the peace and serenity of the spacious iodine-saline spa. When bathing in the healing water of the iodine-saline spa, the focus is clearly on peace, relaxation and health. A large bathing world with vital & health pools and a relaxation bath with underwater music, relax in the 32-degree-warm healing water of the large thermal outdoor pool. 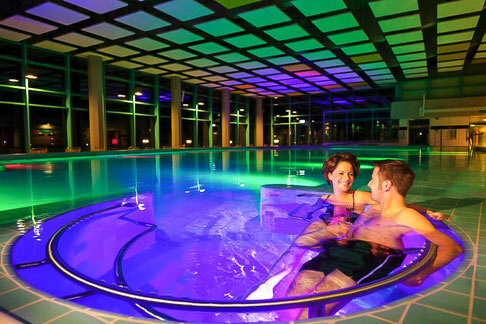 With 925 square metres, it is the largest outdoor thermal water area in northern Germany. A salinity of three percent ensures the well-known healing effect on body and mind.